This lovely couple from Miami have known each other a long time and came to the Orlando area for their destination wedding. 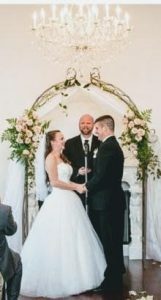 It was held at The Luxmore Grande Estate in Winter Springs with Taylor Curington of Blush as their wedding coordinator. Kudos to Taylor for a wonderful job but an extra shoutout for her diligent work moving the ceremony indoors because of all the rain we experienced in mid-May. Elizabeth with Luxmore was equally awesome with all those details. The photography was by Cricket Photography and A Marc in Design was the Florist. Even with the rain and adjustments in details it was a beautiful ceremony and a special moment for their family and friends. Congratulations Tiffany and Milan! It was my honor to be there for you at the beginning of your journey as husband and wife- Cameron Edgar.